Just stop. Really. Ignore them. The all too hidden realities of our changing economy are the cuts affecting our ability to deliver clean water economically; develop a world class, safe transportation system; and compete with reliable energy developed through US innovation and finance but produced everywhere else. Many of these cuts are called ‘business friendly,’ but in reality are only friendly to a very small number of businesses. Not calling attention to them, as we chase the latest 140 characters, is a disservice to our economy and to the businesses the administration purports to promote. Water is essential for life. Clean water is the difference between health and illness. Yet the EPA is seeing aggressive cuts to our water infrastructure. Having learned the lessons of Flint Michigan, we need to understand the risks in ancient water systems. Let’s not leave leaky and old pipes in the ground. As Scott Pruitt, for the first time in EPA history, has called for an increase in his secret service, the EPA has cut funds and personnel responsible for cleaning polluted rivers and lakes, as well as upgrading an infrastructure unable to withstand either floods and droughts. These threats affect employees as well as company’s ability to keep producing. If we wait, we may find that water has become a commodity so expensive that we have to ration who gets what and when. Another round of EPA cuts is aimed at enforcement of toxic site clean ups. When those sites are not properly investigated, the tax payers foot the bill instead of the polluter. While this seems to be a boon to businesses, in reality it only supports those who have fled the toxic sites they created. The small and medium sized businesses near these ‘brown fields’ are affected by higher taxes, as well as the potential leaks that threaten water and soils in neighborhoods where they and their employees live. Another threat to business is the reductions in the department of energy funding for science research. This funding has traditionally helped companies with innovations that drive a competitive future. Many of the technologies that have made America a leader have originally come from programs under ARPA, the Advanced Research Projects Agency. Current threats are aimed at eliminating ARPA-e, the energy arm of ARPA. Whether we like it or not, energy is a changing landscape. New data has made it possible to reduce the up to 60% of transmission losses that affect our grid efficiency, while promoting reliability by helping utilities predict transformer failures before they occur. New energy efficiency systems installed by commerce and residential customers has helped reduce the need to build new power stations, while delivering the high quality energy needed by the likes of server farms and pharmaceutical manufacturers. If we do not fund research, others — like China and Russia — will. Another threat is reductions in the Department of Transportation budget. While the administration is spending more than ever on their travel and those of their agency heads, our roads and public transit go begging. This is especially problematic for the Millennials in cities, who are increasingly turning to alternatives for cars. All along the Northeast corridor from Washington DC to Boston, as well as the Midwest around Chicago, and the West-coast from San Francisco to Los Angeles, have plans for public transportation. Those systems increase the flow of goods and services, as well as expanding the employee base as clogged cities become increasingly so expensive that they are driving up the cost of talent. So, don’t take the bait. Just ignore those bright shiny tweets, and talk about the stories that matter. Our economy depends on it. Our democracy depends on it. 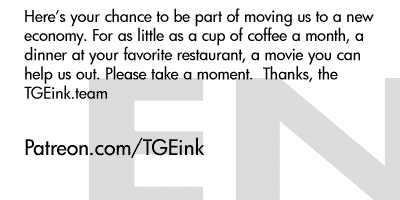 And while you’re at it, support real journalism at TGEink, the magazine of the Green Economy. Find out what’s happening with our newsletters, and raise your voice about the policies that matter to you. Patreon: support us for the price of… whatever you want! 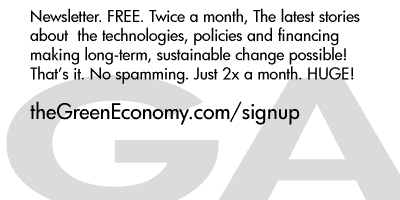 Newsletter: sign up now!